Marseille being the European Capital of Culture for 2013, the French ministry of Culture has decided to return the famous Fort Saint Jean to its former glory. This emblematic monument, located at the entrance of the Vieux Port, has been entirely renovated to be integrated in the museographic entity of the MuCEM. 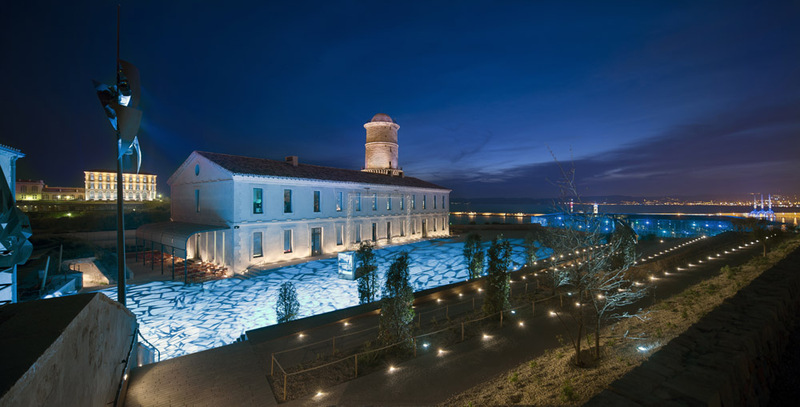 This renovation, both of the structure and the landscape, has created, with success, many different gardens of Mediterranean styles at the very heart of this historical military monument. The audience is invited to wander the many ramparts and squares of the Fort to discover plants and trees that compose the Mediterranean landscapes. To continue this walk after nightfall, Agence Lumière as worked on a scenography, putting into perspective the different parts of the fort. The Exterior 400 Image Projector from Martin Professional create this effect thanks to their rotating gobo and color wheels in addition to their focus. The seven 50W white LED are powerful enough (7000 lm) to guarantee a real visual impact despite the simultaneous use of gobos and color filters.